The Behavioural Medicine Group focusses on weight management and smoking cessation and Laura has been involved with both of these areas. She has been working on data from the WRAP (Weight Loss Referrals for Adults in Primary Care) trial looking at the relationship between weight loss and mood. The WRAP trial provides a good opportunity to study whether intentional weight loss results in an increase or decrease in symptoms of depression and how this is affected by being in a group setting. Laura and colleagues are currently writing this work up for publication. During her academic block, Laura was also able to submit a grant application for a trial looking at very low energy diets as a treatment for non-alcoholic fatty liver disease. This application won a Dr Falk-Core research grant and Laura is looking forward to continuing this work as an academic clinical fellow in the department. 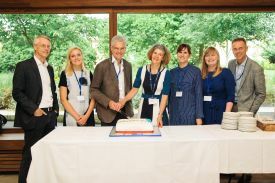 The Cochrane Tobacco Addiction Group recently had their 20th anniversary conference and Laura was part of the team that conducted the qualitative analysis of responses to determine future priorities in tobacco research. The initial paper outlining the Group’s work has been published and the paper describing the research priorities is due to be published later in 2017. Laura has also written for InnovAiT, the GP training journal on electronic cigarettes and, during her dermatology rotation, on lichen planus.